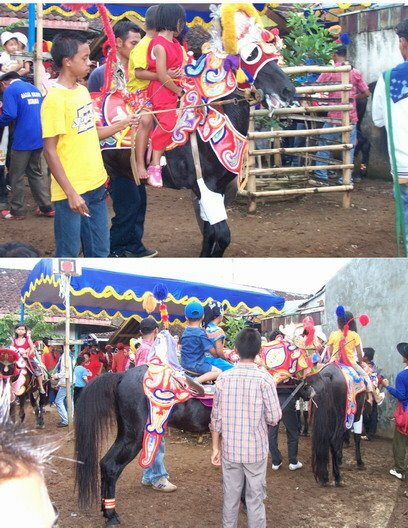 In Sumedang, in Java (Indonesia), there is a tradition of horse-dancing. Kadu ("horse") Reggong is a dancing performance by a costumed horse, accompanied by a gamelan orchestra. Kadu Salit is a performance said to imitate the martial arts, where the horse moves on its hind legs. Reggong horses are popular at weddings and circumcision celebrations. The image at left appears to be of a horse working at liberty, although in other images the horses appear to be directed by reins or a lead attached to a bridle. The costumes are very armor-like and colorful. I can't tell what they are made of. The web is deficient in good images of these horses, but there is one here and here and here. This horse in the Philippines has its tail trimmed into a series of bells. Presumably this is solely ornamental. 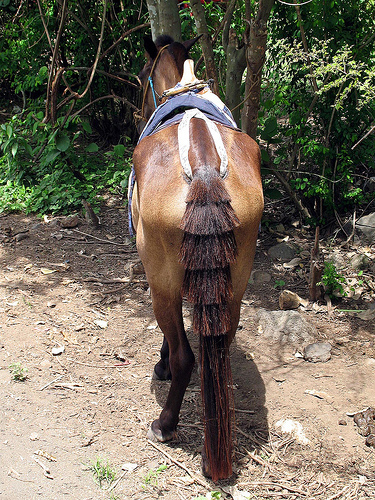 Mules' tails in the United States are sometimes cut this way, but I've never seen this style on a horse before.